Put comfort and fit at the top of the priority list, rather than good looks. Use waist straps attached. They are there for a good reason. 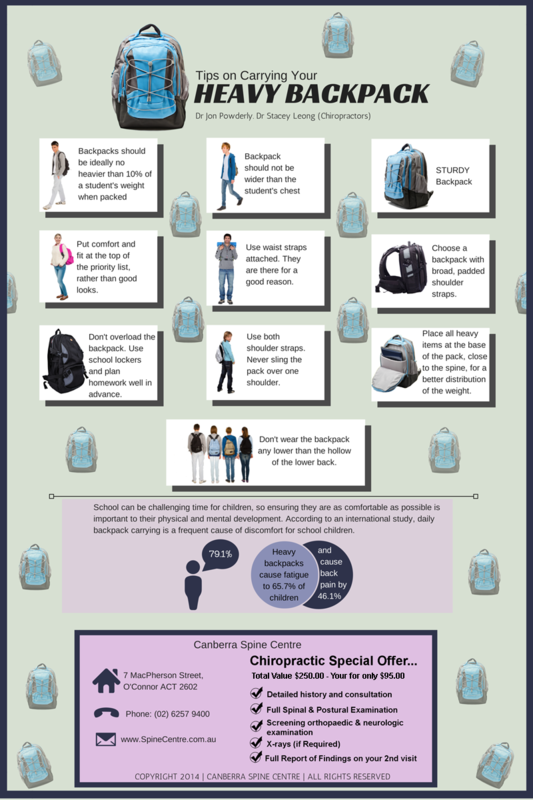 Don’t overload theBackpacks. Use school lockers and plan homework well in advance. Use both shoulder straps. Never sling the pack over one shoulder. Place all heavy items at the base of the pack, close to the spine, for a better distribution of the weight. School can be challenging time for children, so ensuring they are as comfortable as possible is important to their physical and mental development. According to an international study, daily backpack carrying is a frequently cause of discomfort for school children. Come and visit your Canberra chiropractor today here at Canberra Spine Centre. Book your appointment online or call us on (02) 6257 9400.